We often think of personal loans for urgent cash needs. However there are a lot of other cheaper options than personal loans that you should consider. 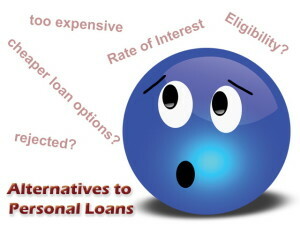 Here are the 7 best alternatives to personal loans in India. Very often people scamper for a personal loan when met with some financial urgency or meeting the expenses of a family wedding or even for some personal expenses that are unavoidable; heck some even take for travel and leisure. However you must remember that personal loans should only be taken when no other option works for you as personal loans are among most expensive type of loan after credit card loans. Personal loans carry an interest rate between 13 to 32% approximately depending upon your eligibility, tenure and amount of loan involved. The reason they are attractive to a lot of people is that personal loans do not need any security against them and are sanctioned by banks on the basis of just your income and repayment capacity. The other reason that makes personal loans attractive is that it is processed very fast and involves minimum paper work. But there are a lot of cheaper loan options in India that one must consider. Gold Loans: Being an Indian, Gold has to be on your mind and chances are you do have some jewellery or coins etc. that you do not use on a day to day basis and is lying idle in some locker. This gold can be used to get you money to meet your needs at much lower rates than personal loans. Gold loans are offered by banks and financial institutions and they are sanctioned very fast too. Usually it takes a day to get the gold loan sanctioned and can be had up to a value of 80-90% of the gold you deposit against the loan. The interest rates are usually around 12-13%. For more information on why Gold Loans score over Personal Loans you can refer here. Loan against Insurance Policies: The other option against personal loans that you have is getting a loan by mortgaging your insurance policy. If you have an insurance policy, then the insurance provider can give you a loan up to 80-90% of the current surrender value of the policy. The interest rates in this kind of policy are between 9-13%. However, minimum 3 premium paying years should have been crossed for you to be able to pledge your policy for a loan. Loan against PPF: If you have been investing in Public Provident Fund for over 3 years, then you can get a loan against the amount deposited in your PPF account as well. However the amount of loan will be limited to 25% of the balance plus interest as on the end of first year of your PPF account. You can take a loan between the 3rd and the 6th year. This means if you opened an account in 2009-2010 then you can take a loan 2011-2012 onwards until 2014-2015. The maximum repayment limit is 3 years or in 36 EMIs. You can take multiple loans between the 3rd and the 6th year only if previous loan is fully paid off. Loan against Fixed Deposits: If you have some fixed deposits, you can use them as a means to meet your financial shortfall. You need not liquidate them, instead just get a loan against FD from your bank up to 70-80% of its value. The interest rate is usually 1-2% higher than the interest rate you receive on your FDs so for instance if you earn 9% on your FD then you pay 10-11% on its loan which is still lower than the personal loans and effectively only 2%. However the loan against FD needs to be paid before the Fixed Deposit matures. Loan against Other securities and Investments: Just like FDs, your investments in Mutual Funds and Shares etc. can also be used to take loans from leading financial institutions and banks. The interest rate may vary, but is still lower than the ones charged in case of personal loans. However do remember that the institutions or banks have a list of approved mutual funds or companies whose shares can be used as collateral to get loans. The amount of loan sanctioned will be lower than the total value of your securities to guard them against market fluctuations. Loan against property: The most well known way of getting loans for ages, loan against property can be obtained at a rate of 11-16% which is close to the ROI on personal loans, but is recommended only if your cash requirement is huge and you do not have any other source for getting loans. Banks and financial institution may give loan up to only 60% of the actual value of property. Plots, land, homes, offices etc. can be used to avail these loans. Loan from employer or friends: If you have friends, relatives who can provide you loan, try it as an option against personal loans as in such cases the rate of interest can be low or even NIL. However just be mindful of the fact that money matters can be a bit awkward to handle in friendships or relations. Also the other option is to get it from your employer if there is a provision in your company. The loan amount will be deducted from your salary over a period of time and you can get an advance against your salary or a lump sum upfront. Personal loans are expensive and should only be taken if no other option works out. Also if you are someone who needed to take a personal loan but were rejected worry not as you have other options too. The above are the best possible alternate options for people to avail loans as a substitute to personal loans and all are sanctioned within 2 days to a maximum of 15 days, so are reasonably fast to process. What will happen, if I’m unble to pay Education loan to the Bank….what action will it take…also, will it deduct EMIs from my Father’s account? It depends on what the terms and conditions of the loan are and what is mentioned and what have you signed on. Generally there will be something that bank must have kept as a surety from you, and they will see what they can do with that if you fail to repay them completely. Generally they will negotiate the terms with you and try to find a solution. If everything else fails, only then they will seize the surety that you may have given to them, and proceed with further details. In case if I have an on going loan with a bank. And that particular bank goes bankrupt. What happens with the money I was needed to pay. In case of a bank since a lot of people’s money is at stake in terms of deposits and otherwise, the bankrupted bank would be taken over by a larger bank or merged with another bank and assets transferred. So you would be paying your dues to that new bank and you still would have to keep paying until you settle your dues.